Really easy. Would have benefitted from overnight chilling to firm further: 4 hours left it like a spreadable pate. The pickled cucumber offered a nice contrast. Maybe Melba toast as a side next time. Did this for a "no work" dinner party last night. Substituted chuck steak for beef cheeks, and used slow cooker for 7 hours. Consequently, did not need the 1 litre water. The reduced cooking stock made for a tasty sauce; and the fresh herb salad was a lovely contrast (basil, mint, coriander). Nicely balanced flavourings. Cooked 2 cheeks and thirded the rest of the ingredients. Next time will try only thirding the liquids. Very quick & tasty. Would suggest halving the dressing quantity or you'll drown the salad! Want to learn the secret to creating stunning yet simple dishes for family and friends? 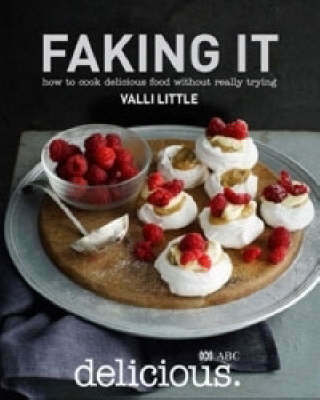 Look no further than Faking It, an essential collection of all-new recipes by Valli Little, food director of delicious.magazine and bestselling author. Even the keenest cooks find themselves short on time and ideas sometimes, and this book has the answers. Whether you're looking for fast midweek dinners or impressive food for entertaining, you'll find yourself reaching for Faking It time and again. Inside, you'll discover the key to saving time in the kitchen without compromising on flavour - including when to use one or two quality ready-made products. With just a few fresh ingredients and Valli's clever shortcuts, you can put together a huge range of creative, fuss-free meals - from quick soups and salads to burgers with a twist, fresh pasta ideas, simple seafood dishes and indulgent desserts. With more than 100 sensational new recipes, each beautifully photographed, Faking It is the book that every clever cook should have on their shelf.